A much belated paean to film. It’s almost Halloween, with the summer holidays a distant speck away. Faint, though memorable, like a drifting scent on the breeze or the lingering finish of a fine wine. Holidays are all about a break from the routine, and so it was a fitting opportunity to reawaken a long-lost love affair with film. Back in the day it was all about 120 medium format. My weapon of choice was a Hasselblad 503CW. Streamlined Swedish design, over engineered manufacturing. Constructed with watch-like precision and the durability of a tank. Made to last, and cost a fortune. Nowadays, it’s the Canikon DSLR hegemony, Lightroom/Capture One workflow, FTP upload. It’s the economy, stupid. No longer do clients want to pay or wait for film and processing, and digital is just so damn convenient, flexible and high quality. What’s not to like? I guess I’m just showing my age, but I miss all that ‘hassle’, just like vinyl nerds geek out about album sleeves and turntable platters. There’s a ritualistic routine that brings with it a certain tactile joy. Loading up that first film back, setting aperture and speed, and clunking out those first few frames was definitely Proustian. It was what holidays are meant for. Is film ‘better’ than digital? Maybe not, just different. But the images certainly have a very different ‘feel’ to them. It’s great to have you back, baby. Herewith, some random frames from our holiday in Gorran Haven, Cornwall. I’m usually pretty clueless with wedding anniversary presents as it’s overshadowed by our daughter’s birthday a couple of days before. But shortly before this year’s (back in late September), I was in County Waterford, Ireland on a travel shoot for Conde Nast Traveller. The final location on the last day was Ardmore, a lovely little seaside village. This was where I stumbled upon Ardmore Pottery & Gallery run by the charming Mary Lincoln. The stars had clearly aligned. It was our ninth anniversary – for which the traditional present was pottery. I was quickly drawn to the simple forms of Mary’s green pottery which was reminiscent of the malachite colour of copper roofs. She explained that the glaze was made from copper, a local metal that used to be mined nearby. It’s this mining heritage that gives rise to the name Copper Coast for the UNESCO Geopark to the east. Within ten minutes I had a card, and a lovely cup and bowl gift-wrapped (my wife’s a breakfast cup kinda girl, and I’m a coffee bowl kinda guy). A leisurely browse around the wares of the other Irish craftworkers in stock and I was soon on the road to Cork for the flight home. Job done! This is a new venture from the youngest generation of the Gordon family. This is the same Gordon family who run the eponymous Gordon’s Wine Bar just down the road on Villiers Street on the Embankment (apparently London’s oldest winebar dating back to 1890). Great coffee (they roast their own) and bright and breezy food make this a great brunch/lunch stop during daytime. And in the evening, it turns all cosy with comfy banquettes and heartier dishes. Coffee fans should also check out the cute latte art, including bears and elephants. A bit behind on this, but in the latest issue of KFH Completely London magazine is a feature I shot on three of London’s hottest chefs who aren’t afraid to use flame, smoke and spicy heat to light up their dishes. Fire in the hold – enjoy! It’s not every day I get to shoot so close to home for Drapers Magazine. 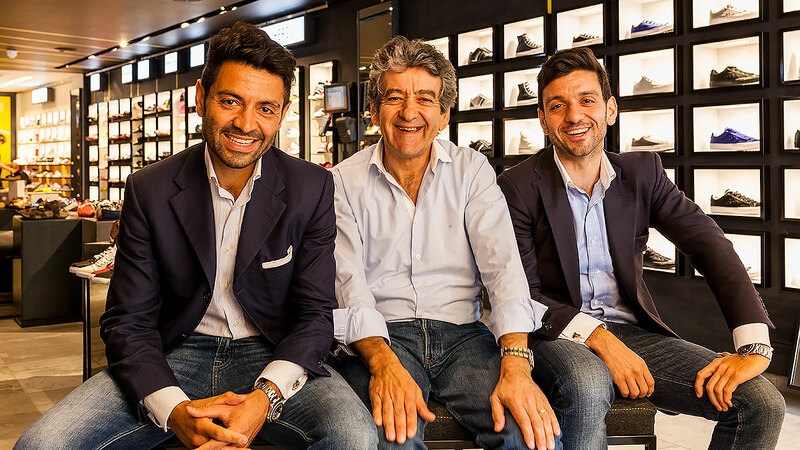 In the current issue, I photographed the father (Harry) and sons (Yiannis and Gerry) team behind Tower London at their latest store in Wood Green. Recent winners of the 2014 Drapers Footwear & Accessories Awards Independent Retailer of the Year, they proudly showed off their new concept store and explained the secret to their success. Despite heavy competition from the big chains, doom and gloom on the high street and online price slashing, their key has been the resurgence of the independent sector and good old-fashioned personal service. The family-run business may only be small at the moment, but it’s ambitious and looking to open many more stores over the coming years, with the next one due on Brick Lane in 2015. Some outtakes from a recent shoot at Lyle’s in Shoreditch for the latest issue of Caffeine. While the restaurant’s food has been widely praised, Lyle’s also pays a great deal of attention to their coffee. The all-day coffee bar operation starts from 8.00am as a separate yet integral part of the restaurant. It’s a slick and precise affair run by James Low (not the James Lowe behind the kitchen) and features timers, scales and dedicated hot water taps at two specific temperatures for tea and coffee. Together with familiar Square Mile, Low also features less well known beans such as Koppi and Belleville, which will change regularly alongside the menu and wine list. And his choice of tea is equally discerning, featuring single-estate, small batch leaves from Lalani. So, if you’ve been tempted to Lyle’s by the restaurant reviews, just don’t forget about the coffee. A last minute job last week for Time Out took me down the road on the bus to a residential pocket of North London flanked by Stoke Newington, Highbury and Cannonbury. In an area not known for it’s destination dining, Primeur is resolutely a neighbourhood restaurant with its quirky no-phone, in-person only bookings policy. Although it had only been open a couple of weeks, it already had the assured feel of a local favourite. A couple of early walk-ins dropped by on the way home for a glass of wine and couple of plates. The welcoming banter gave them away as regulars already. After a quiet start, it was anything but by about 8.30pm. It seemed like someone had rung the dinner bell outside – the place was full and the kitchen slammed with orders. So the ‘new thing’ seems to be just old-fashioned good times.